Pamela Sandler, AIA, LEED AP, has been working with clients to create living, work, worship, lodging, spa and well-being spaces in the Berkshires for over 25 years. Registered in three states, she is well versed in code compliance and experienced in the local permitting process. 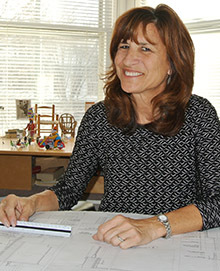 Her portfolio includes award-winning historic preservation projects and she was an early adopter in the use of green building materials and techniques. Her residential work, some of it in the “Not So Big House” category, has been published in New England House. Ms. Sandler brings to her clients an approachable and collaborative working style while keeping a focus on the details, budget and delivery of the project. Owner and Principal. Residential design for new construction, restorations and renovations. Major Commercial clients include Blantyre, Stonover Farm, Seven Spa and Salon, Kripalu Center for Yoga and Health, Hevreh of South Berkshire, URJ Camp Eisner, and Crane Lake Camp. Solely responsible for working drawings for Tierney Properties, Inc., a 120,000 Sq. Ft. office building, Kay Bee Toys headquarters a 100,000 Sq. Ft. building, Berkshire Children’s Community (2) 5,000 Sq. Ft. homes for severely, mentally handicapped citizens. Drawings for Norman Rockwell studio and Lynwood Restoration. Responsible for working drawings for White Pines in Stockbridge, MA. Working exclusively on-site and providing construction supervision for this 68-unit condominium project consisting of 2 multi-unit buildings, duplexes, single homes, a pool pavilion and the restoration of the Ice House. Tulane University School of Architecture 1981.